Certification: ISO, CE, TUV, COC, SONCAP etc. 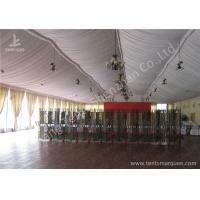 The 15m x 35m large outdoor aluminum frame event marquee tent is built for wedding banquet parties. 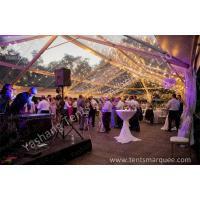 The outdoor marquee wedding tent is made from high quality maintenance free structural grade hard extruded aluminum alloy, and UV resistant flame retardant environmentally friendly double PVC-coated polyester textile. 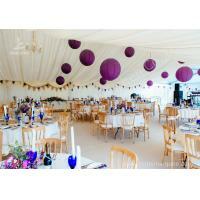 The portable white wedding marquee is fast erected up on the beach and it can be easily taken down and moved away. 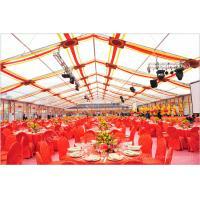 Transparent PVC windows are designed on tent fabric sidewalls using high frequency welding technology with tested reliability. 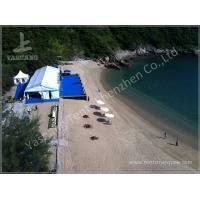 Please contact with us directly to learn about the detailed specification of different tent projects, because the data in the form may not be updated in time. 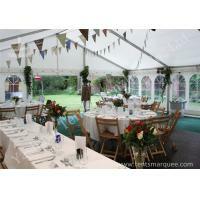 This white wedding marquee can instantly cover an outdoor event space for 300 seaters with round tables and chairs. 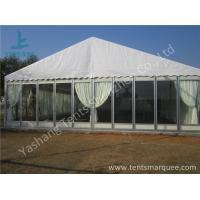 The aluminum framed structure is covered with 850gsm white fabric at top and sidewalls. All the fabric tent sidewalls can be opened for entrance or closed to keep out wind and rain because a zipper is optionally designed at the middle of each pair of tent sidewall. 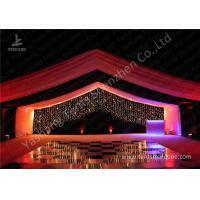 Sorts of wedding decorations are available for our customer's choice to customise an optimum wedding marquee space: optional color roof lining and wall lining, lighting, flooring etc. The colour of roof lining is mixed with white and purple, which is beautiful, noble and harmonious with the roof lining. 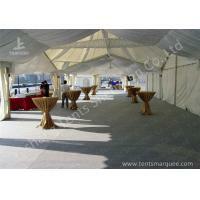 For the outdoor aluminum tent structure, there are three ground fixation solutions. They are expansion screws for concrete ground; steel peg nails for soft grass/sand land and loading plate for the ground that can't be damaged. 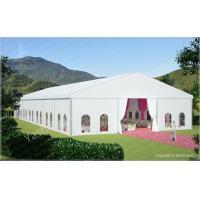 In this project, the wedding tent is installed on the grassland, so the ground fixation solution of steel peg nails is selected. 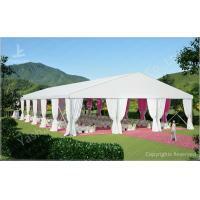 Love her, promise her a romantic wedding tent! 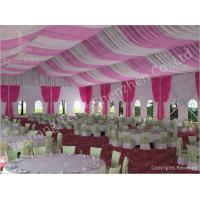 If you choose our luxury aluminum wedding tent rentals with pink white lining decoration, you will save unnecessary worries and win the heart of your Miss Right! I’m glad you have interest in learning more about our company. Better understanding of each other’s corporate culture and values always contributes a lot to future cooperation and gives both total peace of mind. 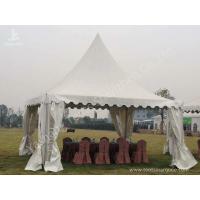 As a total tent solution supplier, we always focus on our client’s specific needs, and tailor reliable sustainable solutions with the aim to help solve the problem faced by our clients feasibly and effectively. This article is just a short briefing of company. If you want to take a deeper look at YASHANG, why not start with a no-commitment, free consultation on just how our instant covered space solution supports where you want to go? I’m sure you’ll get positively impressed by our corporate culture and values. 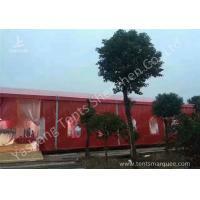 YASHANG, established in 2005, leads in China in the design, manufacture, supply and installation of portable modular temporary buildings, and provides clients with instant covered space solutions suitable for a multitude of industrial and specialist applications, including general temporary storage buildings, distribution, factories, waste management, retail trading floors, commercial events, aviation, ports, military and leisure facilities. We anticipate, respond to and meet our customers’ expectations by providing the best value, quality, and most innovative solutions and technologies. Focusing on the individual need of our customer and providing the most reliable solution is key to our success, that’s why in our corporate value we put our customers at the center of what we do, and this is the only way we can offer them added value, I think. In all that we do, this core value reminds us that our customers are more than just purchasers of our products, technologies and services – they are also our partners. Together with them, we develop solutions tailored to their specific needs, helping them solve the temporary portable space problem feasibly and effectively.